As I glanced up to see the sky this pre-spring afternoon I was privileged to see a beam of sunshine glancing down from a squeaky place between the clouds. I always love to see those beams that are so visible on cloudy days like this when the sun is at that certain late afternoon angle. 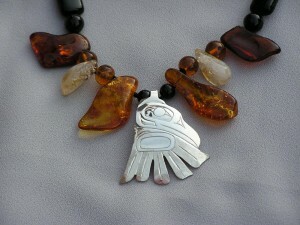 I’ve been trying to find the inspiration to blog about this Raven Revealed necklace and Zap! There it was. 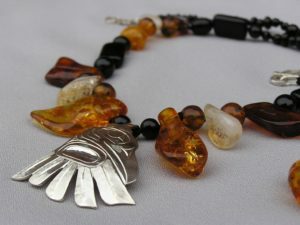 The original inspiration for this Sterling, Amber and Onyx necklace was the ancient story of Raven stealing the light from the old father. This old father and daughter lived in the world before light existed in a cedar wood house next to a stream. Raven had been sneaking about the forest like he does bumping into things because there was no light in the world, when he hears an old man singing about his special treasure of light that was his alone. Raven being the determined character that he is devised a plan to get into that house to find that light, but when he couldn’t find the door he had to revise his plan. The daughter came out to get a big drink from the stream and Raven had to use his magic and change into a spruce needle and was swallowed up by the daughter. He snuggled down inside her, grew as only a magic raven could do and was birthed out as a human child. The trickster Raven, even though he was funny looking with a long nose, beady eyes and noisy, he was playful and won the love and affection of the old father because he was entertaining. Now, Raven tired of bumping into everything, went on a thorough search for this would be light he’d heard the old man singing about and decided it must be hidden in the big box in the corner. When Raven started to remove the lid of the box the old father protested loudly and threateningly. Raven decided to use his childlike skills and whined and cried and screamed and had a total hissy fit that will try just about any old father’s patience. The old father was worn down by Raven’s fussing and gave in to let Raven open the box and explore to see the radiance that glowed within. That was not enough for Raven who wanted to touch the glowing ball, so more and more fussing ensued until finally the old father got the ball out for raven to play. As the light from the glowing ball showed Raven the smoke-hole in the roof he transformed back to Raven, stretched his wings, grabbed the ball in his beak and flew through the smokehole into the sky. The mountains and trees and the entire world around him was illuminated like never before. The Eagle also saw Raven and flew to harass him as Eagle and Ravens do to each other and Raven dropped the sun down to the rocky ground where it broke into pieces and flew into the sky as one large piece and another smaller bit and lots of smaller sparkling glowing pieces. There they remain to this day as the sun, moon and stars. The old father was so upset that he sat outside his house weeping until he looked up at his daughter and saw for the first time that she was a very beautiful young woman and so he began to see and was thankful for the wisdom of that prankster Raven. Owen hand carved the Sterling Raven and I strung the necklace up with the delicious, glowing light and dark golden nuggets of Amber to represent the sunlight cast into the sky by raven. There are also some crackled Citrines to give light a good opportunity to bounce around and maybe represent the stars. 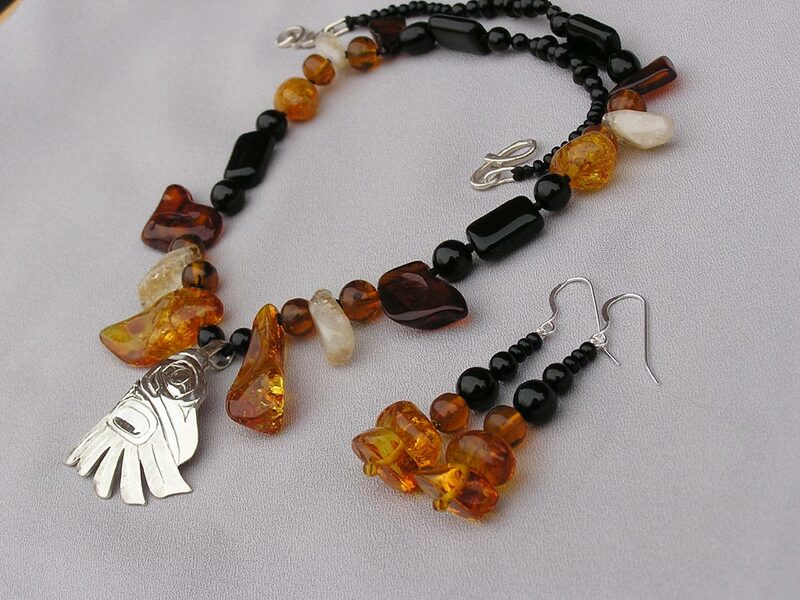 The black beads are Onyx, Jet and Czech glass, of course to represent that Raven character. The necklace is 21 inches long with earrings to match. Thanks for hookin’ me up, Kelly!